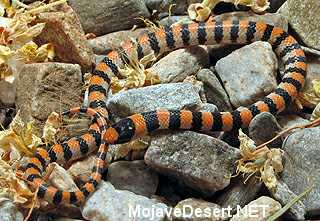 In California, the ground snake is widely distributed in a variety of arid and semiarid habitats in the Mojave and Colorado deserts up to 1400 m (4600 ft) in elevation. It frequents hillsides and flats with or without rocks, usually where there is fine, wind-blown sand. It is found under rocks and other cover objects or at the base of bushes or grass hummocks. In some places, it occurs in thick vegetation (Stickel 1938, 1943, Stebbins 1954). This species is active in spring and summer. Feeding: This snake eats spiders, centipedes, crickets, grasshoppers, insect larvae and other arthropods (Stebbins 1954). Cover: The ground snake makes use of rocks and other ground cover when available, but also occurs in habitats where such cover is rare. Usually it burrows in fine, wind-blown sand at the base of bushes or grass hummocks (Stebbins 1954). Water: Permanent water is probably not required. Pattern: This species occurs at lower elevations in a variety of desert habitats in which fine wind-blown sand is found (Stebbins 1954). Activity Patterns: Nocturnal, but occasionally individuals are abroad at dusk. Active from spring to late summer. Seasonal Movements/Migration: This snake probably does not migrate. Frost, D. R. 1983. Sonora semiannulata. Cat. Amer. Amphibians and Reptiles 333. Stickel, W. H. 1938. 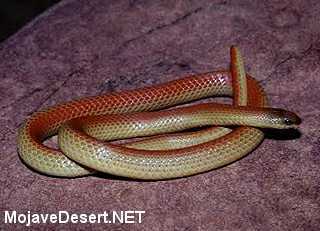 The snakes of the genus Sonora in the United States and lower California. Copeia 1938:182-190. Stickel, W. H. 1943. The Mexican snakes of the genera Sonora and Chionactis with notes on the status of other colubrid genera. Proc. Biol. Soc. Wash. 56:109-128.39:335-348.